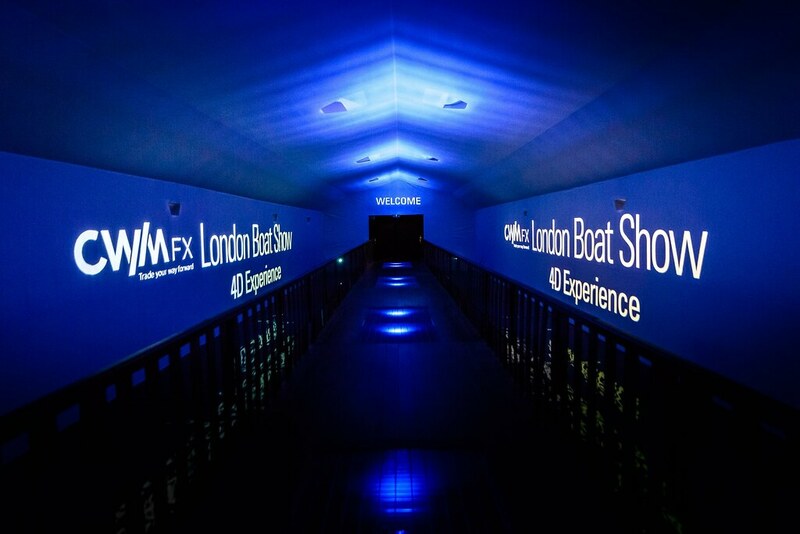 Shared VR tunnel for the 2016 London Boat Show. Working closely with Drive Productions, we designed and installed the 20-channel immersive projection system for the London Boat Show's 4D Experience Tunnel. The concept was to drop the audience into the middle of the ocean by combining photorealistic CGI imagery, 4D environmental effects and surround sound. When Drive Productions came to us with this project we jumped at the chance. Although not Igloo's standard 360º set-up, we love creating immersive projection experiences, so had to be involved. The sheer size meant we brought in 22 projectors. By networking three Igloo Media Players and tweaking the standard Igloo software, this was no problem at all.